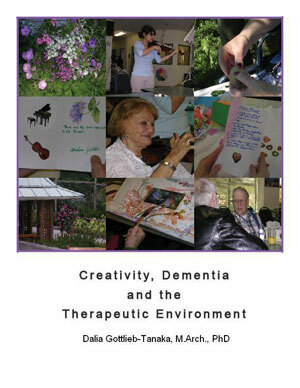 Dalia Gottlieb-Tanaka, PhD, Chair of the Society for the Arts in Dementia Care, Vancouver, British Columbia. Based on Gottlieb-Tanaka's dissertation and aims to explore the physical environment and links it to the level of success of creative expression programs for seniors with mild cognitive impairment to moderate dementia. It focuses on the circumstances that enhance or limit the seniors' ability to express themselves creatively. Understanding the physical, cognitive and social abilities of this population helps define the strategies for designing the shape and form of the physical environment. This book is based on Gottlieb-Tanaka's dissertation and aims to explore the physical environment and the level of success of creative expression programs for seniors with mild cognitive impairment to moderate dementia. It focuses on the circumstances that enhance or limit the seniors' ability to express themselves creatively. Understanding the physical, cognitive and social abilities of this population helps define the strategies for designing the shape and form of the physical environment. With appropriate architectural planning and design, such environments have the potential to attract seniors with dementia to stay in the space and become engaged in creative expression activities. But the space alone is not enough to engage the seniors. Success in implementing a creative expression program is linked strongly with an understanding of the seniors’ physical and cognitive abilities and with the commitment of the facilitator to adopt a flexible approach to each individual. This book is based on qualitative research conducted with seniors at two adult day care centres. It will be of interest to health professionals, architects and designers, care providers, administrators of care facilities and families of people with dementia. Dalia Gottlieb-Tanaka earned her PhD from the University of British Columbia (UBC) in 2006 in the Institute of Health Promotion Research and the Interdisciplinary Studies Program. In 2011 she completed a Post Doctorate Fellowship with the Department of Psychology at UBC. In 1976 she graduated from the Bezalel Academy of Arts & Design in Jerusalem, and in 1980 received a Master's of Architecture degree from UBC. After working in architecture for about 30 years and raising a family, Dalia returned to school to pursue a new direction in gerontology, specifically in the study of creative expression, dementia and the therapeutic environment. “This research makes new and important contributions to the diverse fields of expressive arts therapy, psychology of the aging, and universal architectural design. It is an ambitious multi-disciplinary work that pioneers new areas in need of further study and research.